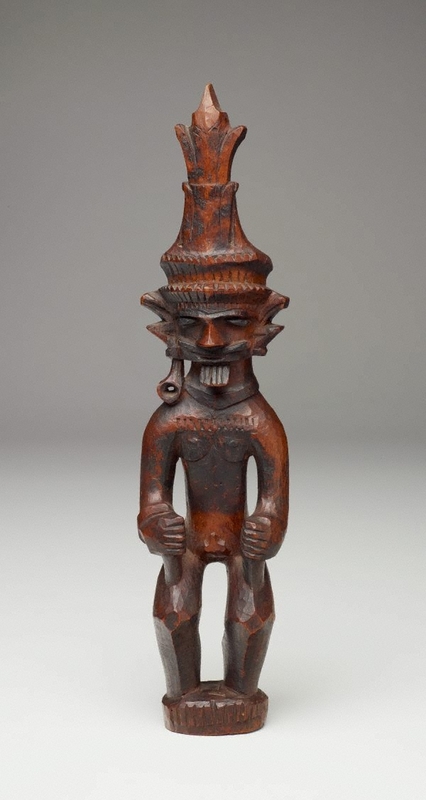 Ancestors play a crucial role on the island of Nias in ensuring success, wealth and fertility among the living, and in avoiding disaster or misfortune. Following the death of an individual, a wooden image or ‘adu zatua’ was prepared as an abode for the ancestral spirit to mediate between the human world and the realm of the gods. ‘Adu zatua’ required regular offerings to ensure the continued benevolence of the ancestor for the benefit of the living, and to further elevate the ancestor’s success in the afterlife. This ‘adu zatua’ is depicted wearing the regalia reserved for the noble aristocratic class of Nias, finery closely connected with the gods of the upper world. This includes a tall crown-like headdress, which alludes to the cosmic world tree or ‘tora’a’ and the layers of the universe, and golden accoutrements indicative of status and wealth, including a ‘nifato-fato’ necklace, armband, single earring and false facial hair. Joy and Byron Clear, Jun 1988, Australia, purchased from Christie's, Amsterdam. Gabriella Roy, 1999, Sydney/New South Wales/Australia, with Gabriella Roy at Aboriginal and Pacific Art Gallery (art dealership), Sydney. Mariann Ford, May 1999-Dec 2010, Sydney/New South Wales/Australia, purchased through Gabriella Roy at Aboriginal and Pacific Art Gallery (art dealership), Sydney, May 1999. Gift to the Art Gallery of New South Wales as part of the Christopher Worrall Wilson Bequest 2010.